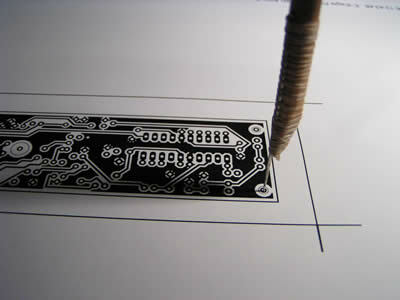 I found other Japanese site about toner transfer PCB. This site include full of information about this subject and very informative, but only in Japanese. I improved my technique referring to above site. 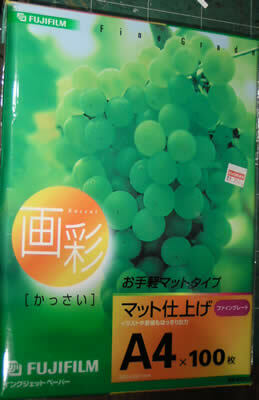 I used “Fuji Film Mat Fine Grade Ink Jet Paper” introduced by above site. This paper is absolutely fabulous. Very easily removed just by soaked in water for a couple of minutes. Steaming is not necessary at all to remove it. It seems the ultimate solution for me. I do not feel any need of “Press-n-Peel”. I have no idea if this paper is available outside Japan. However same kind of paper may work as well. Alignment of top and bottom patterns is always quite difficult and frustrating. This time I worked out new method. At first make two pinholes at alignment holes on top pattern printout. 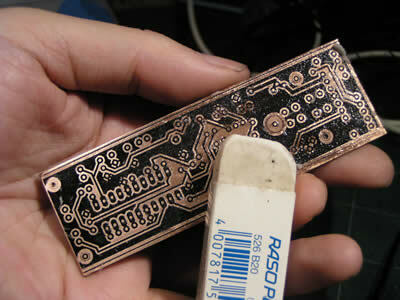 Put the printout on raw PCB, lightly fix it by ironing and drill holes through PCB at pinholes. 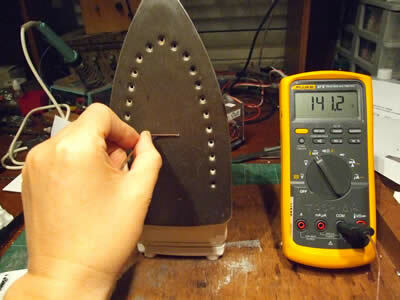 Temperature setting of the iron is very important. See below. Turn it over and align bottom printout using alignment holes by help of pins. Apply iron well on both sides to fix the toner. By soaking in water for a couple of minutes, the paper comes out easily. Remaining pulps shall be removed by rubbing by thumb. 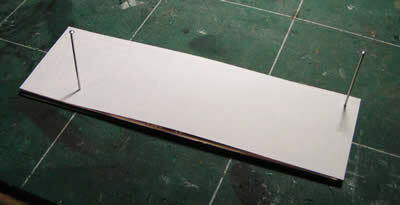 Further removal can be done by rubbing by an eraser while wet. The parts shown with arrows having pulp residue and these parts took longer time to be etched. So I feel it is better remove pulps as much as possible. Etching finished. The result was quite satisfactory. Recent toner transfers have not worked well. 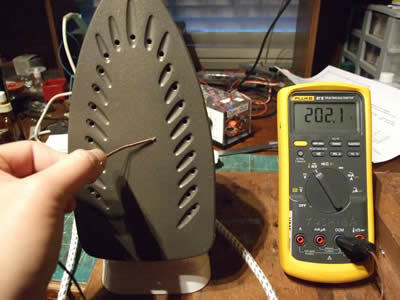 So I made some investigations and found temperature setting of iron is very important. I ironed with highest setting. 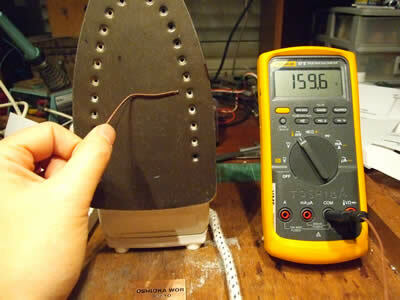 I measured the iron temperature by a thermocouple and found it around 200deg. C. It seems the toner deteriorated by the high temperature. At first I though the temperature was not high enough. 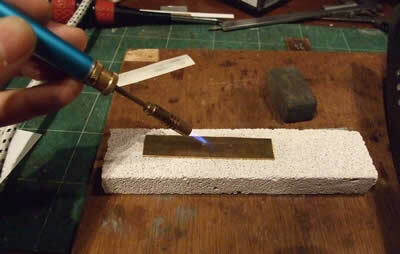 So I tried to heat a piece of brass sheet attached with printout by a blowtorch until the printout turned to brown. The toner did not stick to the surface of the brass plate at all. Then I tried with lower setting about 160 deg. C. It stuck well. I tried to remove the toner by my fingernails, but could not remove some parts. The temperature setting of the iron was “cotton”. The toner stuck well with temperature setting of 140 deg. C. But I could remove the toner completely with my fingernails. It seems 160 deg. C works best in my case. I guess different toners have different characteristics and may need this kind of test printer by printer. 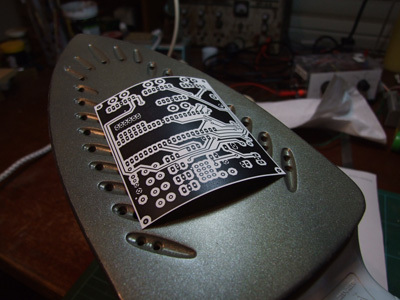 When I made a large PCB, I noticed the paper that carries the pattern shrunk a bit when ironing it to the PCB. It caused a problem on aligning front and back patterns. The shrinkage caused by water evaporation from the paper. 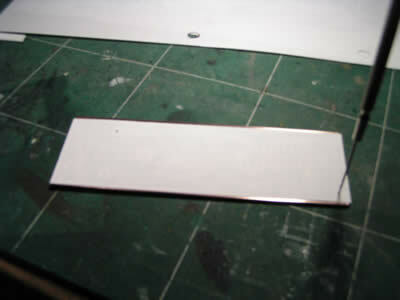 So pre-shrink the paper by heating up before applying it to the PCB. I use only low temperature setting like “silk” to do this.